Here's Retrovision, and it looks like something a friend of mine did - jamming a CD adapter into a cassette adapter into the eight-track slot of a Dodge Colt's car stereo. 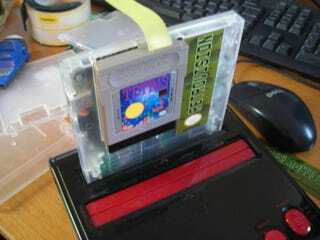 Retrovision is about as practical, yet just as awesome. Nintendo Age user Bunnyboy built this adapter, which allows one to play Game Boy carts on your television through a Nintendo Entertainment System. Why someone would want to, or even should do something like that is beyond me, but I'll grant that it's 31 flavors of cool. That said, consider carefully whether those monochromatic graphics up on a big screen is a trick worth $130, because that's Bunnyboy's asking price for the device. "It's expensive: yup! Expensive parts, expensive development, lots of PITA assembly," he writes, justifying the cost. Bunnyboy says he doesn't have any units for sale immediately, but should "after vacation" when he has more time to assemble them.